SE-6H 6 Meter Halo Antenna. 6 Meter Halo Antenna that covers 50 to 52 MHz at 1.3:1 or less VSWR. Adjustable setting that provide 1.3:1 VSWR over a 0.2 MHz bandwidth. 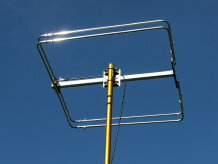 The SE-6H Halo Antenna is designed for horizontal polarization for use in the lower CW/SSB portion of the 50 MHz six meter band. Constructed of 1/2" and 3/8" hard drawn 6063-T832 aluminum tubing, 6061-T6 aluminum tubing, UV resistant PVC, stainless steel hardware and a mast bracket that accommodates a 1" to 2" OD mast. Comes standard with a female UHF connector, or no cost Type-N connector. Feedpoint is designed with a DC ground to help eliminate atmospheric static noise builup. Click picture for ordering and additional information. 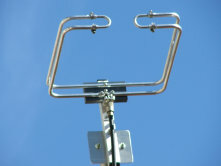 2 Meter Halo Antenna that cover 144 to 146 MHz with a 1.5:1 VSWR at 2 MHz Bandwidth. 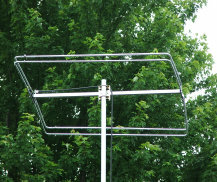 The SE-2H Halo Antenna is designed for horizontal polarization for use in the lower CW/SSB portion of the 144 MHz 2 Meter band. Constructed of 3/8" hard drawn 6063-T832, and 6061-T6 aluminum, UV resistant PVC, stainless steel hardware, and a mast bracket that accommodates a 1" to 2" OD mast. Comes standard with a UHF connector or an optional Type-N connector. Feedpoint is designed with a DC ground to help eliminate atmospheric static noise buildup. Click on picture for ordering and additional information. 1) Twice the bandwidth of a single element construction. 2) Direct 50W matching eliminates the need for a matching network. 3) Direct 50W matching eliminates detuning caused by rain or snow. 5) Direct DC Ground to help eliminate atmospheric noise buildup. 6) Mount that allows for 1" to 2" mast. 7) UHF connector standard, Type-N connector no charge option. 8) Simple tuning provided by varying the length of the two "U" shaped tuning elements locked in place with stainless steel hose clamps. Sal Electronics halo antennas have a true DC ground design that gives a direct short from the connector center pin to the outer shield. This provides total grounding of both the center conductor and the outer shield that provides superior atmospheric static suppression. The common Gamma Match only provides grounding to the outer shield of the RF connector. The center connector will always show an open due the series capacitor feed. 10 Meter Halo Antenna that covers 28 to 29.7 Mc. Adjustable setting that provide 1.5:1 VSWR over a 0.380 Kc. bandwidth. The SE-10H Halo Antenna is designed for horizontal polarization for use in the lower CW/SSB portion of the 28 Mc. ten meter band. Constructed of 1/2" and 3/8" hard drawn 6063-T832 aluminum tubing, 6061-T6 aluminum tubing, UV resistant PVC, stainless steel hardware and a mast bracket that accommodates a 1" to 2" OD mast. Comes standard with a female UHF connector, or no cost Type-N connector. Feedpoint is designed with a DC ground to help eliminate atmospheric static noise builup. Click picture for ordering and additional information.